Sailing boat Linssen Grand Sturdy 36.9 AC named La Siesta (Sa) has been produced in 2012. We offer her from port Kressbronn in the region close to Inland. La Siesta (Sa) is certified for 4 pax. Layout of the boat is 4 (4+2). Linssen Grand Sturdy 36.9 AC La Siesta (Sa) is equipped with 2 bedrooms. For guests disposal there are 2 heads. You can fill the diesel tank with 360.00 l l. and in tank for water it goes even 300.00 l liters. With engine 75 hp La Siesta (Sa) can move really fast. La Siesta (Sa) is 11.10 meters long and 3.40 meters wide. Depth is 1.00 m. Use the search engine for search for more yachts by clicking on this link: Motorboats Kressbronn. Yacht's equipment includes : Wc pump electrical, Gps plotter, Autopilot, Inverter 12v-220v, Bow thruster, Heating, Radio / cd player. . Nonrefundable deposit is at the level of 1000.00 EUR. Choose our offer and have good time on the deck of La Siesta (Sa). 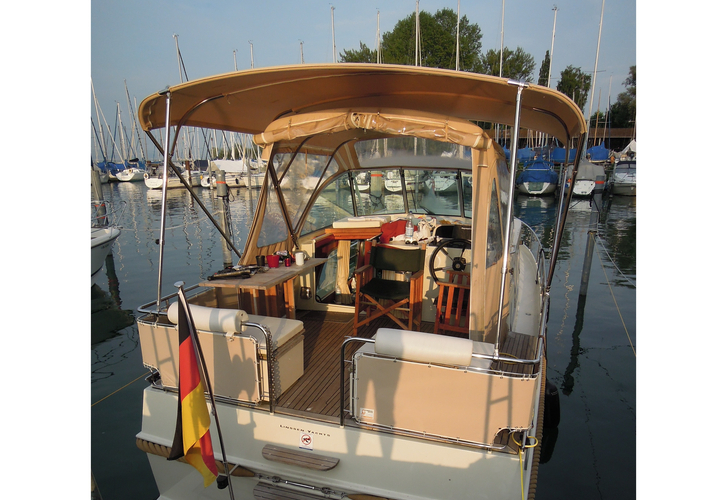 This Linssen Grand Sturdy 36.9 AC from Kressbronn from Germany See under this link: Motorboats Germany.